Well, it's still Christmas Carol season over here at the Fake-n-Bake kitchen. The show is open, but the standard little repairs and maintenance are coming over to the shop. You know, a $400 piece of electrical equipment was installed incorrectly and fried, the dead body's lead shot is leaking out of it's shroud, the usual stuff. No one has caught on fire yet (this year) so we're still pretty hum-drum on notes. This week, I want to bring you two examples of salt dough pies from two very different Christmas productions. The first set of pies are from our production last season of "The Seafarer." The second act of this play centers around a Christmas day card game between a group of bachelors. Of the men at the table one is blind, one is playing for his soul, and the only man who isn't an alcoholic is actually Satan. So, obviously, they have some very festive refreshments including smoked salmon and store bought mince pies. By the time we see the men, they have devoured most of their treats, and we see only the remnants of their Christmas feast. I started out by researching mince pies, it turns out that they are a British tradition, and that frozen and packaged mince pies are readily available. We purchased a package of little mince pies from an online British Grocer for research, and also to use the packaging as a prop. The pies themselves are made of salt dough. You can find all sorts of salt dough recipes online to fit your taste, but basically, salt dough is salt, flour, and water. Thin sculptures can often be air dried, but baking tends to be faster. I mixed up a batch of salt dough, and sculpted it around some 1" long cut-offs of curtain rod. I just wanted to make sure that the dough wasn't too thick to dry out thoroughly. I used a muffin pan to give me a good bottom shape, and cut out little Christmas trees for the top of each pie. I then baked the little pies at 250 degrees F for about an hour, or until they seemed to be dried completely. For paint, I just used watered down acrylic paints, and then coated the pies with flex glue or acrylic medium ( I don't remember which.) Though there are six pies, only two made it out onto the plates. On one, I broke the pie open and filled it with hot pour vinyl, as if it were half eaten. Do I have a photo of this hilarious half eaten pie? Yes, but I can't find it. Sorry about that. Sarah's Christmas Carol pies are also made out of salt dough. In fact, her pies are entirely salt dough, with no filler in the middle. This seemed to work out just fine, though the dough did seem to contract some during the baking process. The edges of the dough pulled up just slightly from the pans, but not enough to be problematic. Sarah had a much nicer plan to color her pies than I did. She used amber shellac on the pies which gave them a delightful golden brown color and a sealer coat in one go. She did use multiple coats of the shellac in the middle and along the edges to give the color some depth and make the pies look like they were fresh from the oven. 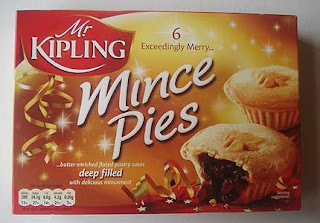 You can see a photo of Sarah with her festive pies up at the top of the blog. Darling, aren't they?